At Senapa Cards, we love to inspire to-be-weds and event planners by incorporating our gorgeous invitations, favors, gifts and decor into some of the most compelling wedding and event themes. We also love sharing information that will take events to the next level. Out of this love, Senapa Weddings was born. As we prepare the next issue of Senapa Weddings, we invite you to peruse the latest issue by clicking on the magazine cover at left. It was our pleasure to showcase all featured vendors and event professionals and look forward to showcasing more stars of the wedding and events realm. We feel confident that you'll agree that the visual and editorial quality of Senapa Weddings is top-notch and its pages are inspirational. 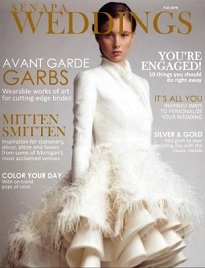 The magazine's style is elegant and sparkling, simple and contemporary, and creates an inviting world that has something for all couples preparing to wed.
We would love to hear your comments regarding the latest issue and/or suggestions for upcoming issues. It is our aim to serve you, our customers and readers. Your feedback serves to make us better. For that, we will always be grateful.